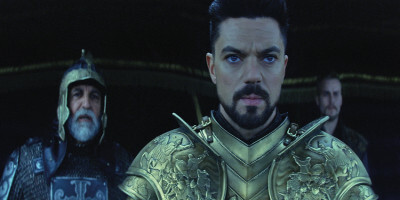 Dracula Untold unveils the origins of the man who became Dracula. 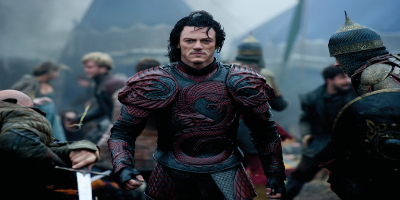 Luke Evans (Fast & Furious 6, The Hobbit: The Desolation of Smaug) stars in this epic action/adventure story as Vlad Tepes, a local hero who has no choice but to turn to the dark side to save his family and people from slaughter at the hands of the Turkish army. Vlad tepes was taken with his smaller brother by The Turks at a very young age, like most children from the balkans at that time in History Greek's, Romanian, Bulgarian, ltalian. They were called janisseries which means basically foreign blood, in the ottoman army, they were submitted to horrors beyond any belief's, if they where weak they were taken into the harems & the rest I believe you can imagine. This happened to Vlads smaller brother as I pre-mentioned. He never forgot this. Hi did became a feared fighting machine. He returned back to Vlahia, Transylvania. A Hardened Man. After some years his allying king Constantine The Byzantine Empire was about to fall to the turks through betrayal, as he did, not before he managed to send The cross that Jesus Christ was crucified upon to Cyprus, & with it the guardians to be The Templar knights of saint JOHN who the established themselves in Limassol, & the castle that was to be Richard the Lionheart. Vlad then understood his Kingdom was next so he faced the first attack 30.000, & barely had any men left, so he knew how superstitious the turks were he asked his men to bring him the prisoners & did what he picked up in the Janisseries, he ordered the dining table to be brought out in the open & started to drink out of his Royal Cup the blood of the Impaled, then he set them free they went all the way back screaming Drakoulas Vrikolakas DRAGON, THE ONE THAT DRINKS BLOOD, Derived from the ancient Greek Mythological creatures. Anyhow he was also betrayed by a monk & poisoned, with turkish gold. NOW the story goes that that certain monk was found drained of blood, & sightings of Vlad got all the more common, with other traitors found in the same manner. That is how a legend is born!. Excellent film loved it Luke, E. Charles, D, Dominic. Played their part to a T. Add this beaut to your collection well worth it. 09/02/16 by This is SPARTA! Fantastic film. Much better than I expected it to be!